INDYCAR and its television partners on Monday released 2013 IZOD IndyCar Series television windows for network coverage, as well as new race distances at selected events. Live coverage of all 19 events, including ABC’s first primetime race and three doubleheaders – one on ABC and two on NBC Sports Network – highlight the 2013 programming. Additonally, race distances were changed at four events to discourage fuel-mileage racing. NBC Sports Network will televise the season’s first four races, starting with the Honda Grand Prix of St. Petersburg, Fla., at noon (ET) on Sunday, March 24. ABC begins its stretch of broadcasting six of the next seven races with the 97th Indianapolis 500 at 11 a.m. (ET) Sunday, May 26. ABC will televise the Memorial Day Weekend classic for the 49th consecutive year, extending one of the longest relationships between a sporting event and television network. Television time continuity, including starts near the top or bottom of the hour and same on-air times for the first two doubleheader weekends, was built into programming schedules based in part from fan requests. Qualification shows for 12 events, including Pole Day and Bump Day for the Indianapolis 500, plus Carb Day activities and race re-airs will enhance series coverage on NBC Sports Network. The cable partner will continue to air “INDYCAR 36,” which follows a driver behind the scenes during a race weekend. The full schedule for ancillary programming will be announced at a later date. In addition, all 12 Firestone Indy Lights races will be broadcast on NBC Sports Network, including live coverage of the Firestone Freedom 100 at noon (ET) Friday, May 24, at the Indianapolis Motor Speedway. Eight races will lead into the cable partner’s IndyCar Series broadcast, including the season- opener at 11 a.m. (ET) on the Streets of St. Pete. International broadcast partners will be announced soon. Revised distances for four IndyCar events have been implemented to discourage fuel-mileage racing. The new distances better match traditional fuel windows at each circuit. *The street race in St. Petersburg, Fla., will be run with an increase of 10 laps to 110 (198 miles total). *The street race in Long Beach, Calif., will see a decrease of five laps to 80 (157.4 miles). *The Milwaukee Mile in West Allis, Wis., will add 25 laps to 250 (250 miles). *The natural terrain Mid-Ohio Sports Car Course in Lexington, Ohio, will be contested with an additional five laps to 90 (203 miles). Three 50-lap heat races, including transfers to Race 3 for the top-two finishers in the first two qualifying races, will determine the starting grid for the seventh annual Iowa Corn Indy 250 on Sunday, June 23, at Iowa Speedway in Newton. The format for heat race qualifications on Saturday, June 22, also will reward 12 starters with points _ from nine points for the pole-winner and descending by one point each position to one point for 11th and 12th. 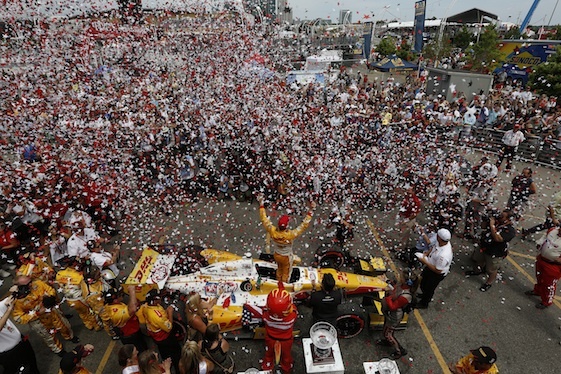 IndyCar Series events, outside of the Indianapolis 500 with its own point framework, pay one point to the pole-winner. Three heat races of 30 laps each replaced single-car qualifications for the Iowa event in 2012. Race 3 consisted of drivers ranked one through eight by combined practice times and race results determined the first four rows. Dario Franchitti of Target Chip Ganassi Racing earned pole position and Ryan Hunter-Reay, who went on to win the IndyCar Series championship for Andretti Autosport, won the race from the seventh starting position. Positions in the three heat races will be determined by single-car, single-lap qualifications on the 0.875-mile, variably-banked oval. A blind draw will determine the qualifying order. “Heat races at shorter tracks such as Iowa Speedway recall the heritage of oval track racing,” Barfield said. Qualifying Heat Race 1 _ Will consist of the even-numbered positions, starting with position eight from single-car qualifying. The results of Race 1 shall determine the even-numbered positions in the starting field, starting with position 12. The top two finishers will transfer to Race 3 and start in positions eight and 10. Qualifying Heat Race 2 _ Will consist of the odd-numbered positions, starting with position seven from single-car qualifying. The results of Race 2 shall determine the odd-numbered positions in the starting field, starting with position 11. The top two finishers will transfer to Race 3 and start in positions seven and nine. Qualifying Heat Race 3 _ Will consist of positions one through six from single-car qualifying plus the first- and second-place finishers from Races 1 and 2 to determine the pole winner and the first five rows of the starting grid. Individual and ticket packages are available at www.iowaspeedway.com or by calling (866) 787-8946.